Let me try to get from Friends to Dante in a more or less plausible manner. You might know that Ross always had a thing for Rachel, but Rachel never took Ross seriously. This was the dynamic for several seasons until they finally got together. In the “emotional,” climactic moment when she at last returns his affections, Rachel says something that used to bother me. Ross asks her what finally changed her mind, and she says something like, “I found out you liked me.” This struck me as anticlimactic and certainly unromantic. What—she saw no intrinsic virtues in him to love? She was responding only to his affection? Like, once she knew she had a sure bet she thought, “What the heck, let’s do it”? I’m not sure why it irked me so much; it’s not like I was that invested in anything that happened on Friends. Maybe it just tipped the scale for me for perverse representations of human sexuality, and I’d had enough. I know I lost what little interest I had in the show right around that time. Yet, ironically, that one moment has plagued me, and I’ve even come to revise my initial reaction to it. Maybe it’s not so bizarre or wrong. Doesn’t 1 John say that we love God because He first loved us? Before you object that “it’s different,” let’s think about this.did He not design us for love? Yes, we cannot love God in anything like an adequate way unless he first awakens and perhaps instills love in us, but did He not design us for love? And don’t we consider human love an analogy to or participation in divine love? and goes on to describe how he learned of Statius’s love of him from Juvenal and how he has since wished him well. What’s the mechanism at work here? In Virgil’s terms, Love stirs in the beloved for the virtue in the lover.it begins with real virtue, that is, something lovable. But the sense is that love or virtue (or both, even) engender a like response—especially, perhaps, in a virtuous soul. Love stirs in the beloved for the virtue in the lover. It’s nice, after all, to learn that someone likes you, much less loves you. It means that person sees value and worth in you. Who wouldn’t respond positively to that? It’s even more powerful when the creator of all that is looks down upon you with love, especially if you have any sense of your own inadequacies. If there is some real virtue in me, and if you love me for it, then it’s not improbable that I will love you in return. Even in the case of Ross and Rachel—two people with some distorted ideas about the world—it’s not surprising to find the same principle at work. We’re all broken in our own ways, after all, and longing to be loved. Statius credits Virgil, a Roman pagan, with leading him to Christ, a testament to the mysterious ways of grace. I personally get rather irritated with evangelicals who act as if only films or books or music specifically stamped “CHRISTIAN” can be spiritually edifying or fulfilling. The suggestion seems to be, first, that only Christians can provide other Christians with good things, and second, that “Christian” means “safe, comfortable, and coddling.” The devout of ancient Israel didn’t criticize Jesus and the disciples because they were too squeaky clean and only hung out with the right crowd. Evangelical avoidance of or resistance to secular culture probably owes to the fundamentalist strain in its history,Art asks us to be thinking, feeling, desiring spirits inhabiting bodies and living in a physical world. and it has been tenacious despite so much talk about cultural engagement and discernment. I’d guess this tenacity owes to a further component of evangelical life: ignorance of art. Evangelicals may be open, in principle, to art, but in practice they just don’t much know what to do with it. It must have power for some people, however, for Statius says that reading Virgil guided him to Jesus. That power, as I’ve argued before in this series, is to engage the imagination, which is the mental faculty best equipped to pull all the parts of our being together. Art asks us to be thinking, feeling, desiring spirits inhabiting bodies and living in a physical world. and then you lighted me the way to God. This is another form of beauty, the beauty of art, which Statius first describes as refreshing and idyllic before offering his powerful and useful image of a guide upon a road who cannot see himself where he’s going but can light the way for those behind him. I’ve gone through phases in my life when The Beatles or Radiohead spoke to me more than the Newsboys or DC Talk (it was the 90s). There are films about some pretty gruesome stuff that are yet so beautiful and true that they feed me more than any Sunday-morning warm-up video of stars shooting over deserts. There are plenty of Christian poets and songwriters and filmmakers out there making things that feed me, too, but I see no reason to artificially restrict how God might speak to me. If you listened to my interview with David Dark, you know he calls those glimpses of truth that we hang onto, wherever we find them, our “attention collection.” They are moments that both catch our attention and to which we return our attention over and over to center our souls. 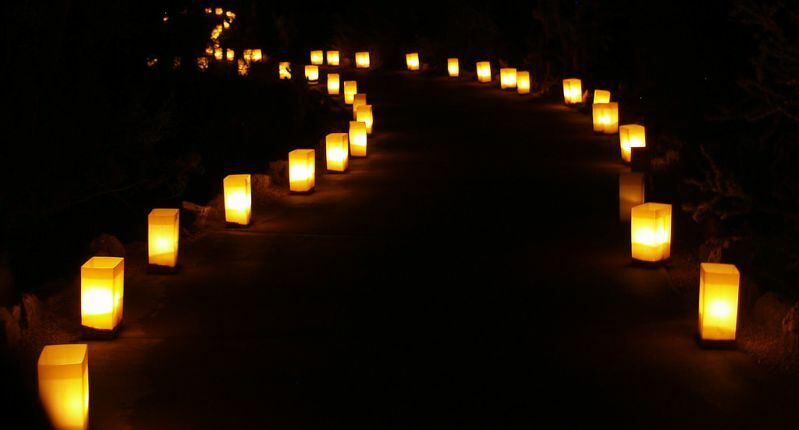 If we pick up Statius’s image, we can imagine a whole parade of authors carrying lanterns before us—or perhaps something like the festival pathways lit by luminaria. For Statius, as for Dante, the collection starts with Virgil. What about you?. How Then Shall We Read?Who Benefits from the Resurrection?